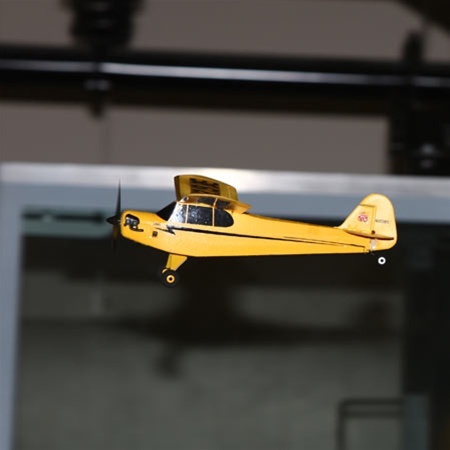 Flying indoor RC planes, especially during the cold winter months , can be a great way to keep your reflexes and thumbs agile! A large indoor area has to be located, like a school gym or similar-the bigger and the higher the ceiling the better. 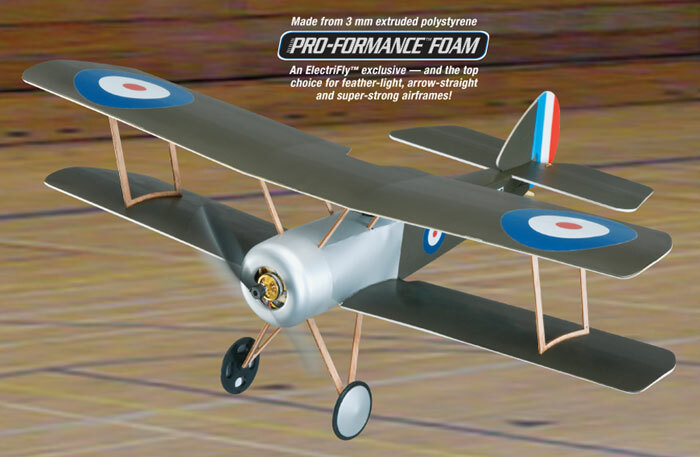 The models required are small and light and can be scale, sport or a fully aerobatic, 3D capable, "foamy". The "foamy" refers to the method of construction of many electric models. The use of foam material, for model construction, along with carbon fiber reinforcements can produce very light and very strong structures. The scratch builder can find extruded polystyrene foam (XPS) in sheet form. Depron is one type that is popular. Many injection molded models are offered in foam, for indoor flying as well as all other types of electric RC airplanes. Please note that scale models are generally a little more difficult to fly and are NOT recommended as your FIRST indoor RC plane. The Pup makes a great scale indoor RC airplane. Easy flying and looks good in the air. Great Planes designed this model specifically for indoor flying but it can also be flown outdoors, on calm days. The video above, shows a couple of Pups, flying in a school gym. Looks like a lot of fun! E-flite Nieuport 17 250 ARF. The Nieuport 17 began service in March of 1916. it was used by the French, British, Russian, Belgian and Italian air forces. The Canadian WW1 ace, Billy Bishop flew it as well as Albert Ball, the British ace. The aircraft design was known as a "sesquiplane." This type uses a small lower wing and attempts to combine the advantages of the high wing monoplane with those of the biplane. The smaller lower wing gave the pilot better visibility and increased the structural strength of the aircraft. E-flite's Nieuport 17 Slow Flyer is an electric indoor version of the French biplane fighter. It's the third in a line of E-flite slow flyers and boasts a low weight and a more majestic type of slow flight thanks to the biplane design and reduced wing loading. So you can get to flying faster, the Nieuport 17 comes with many prefinished details, including wood interplane and cabane struts, molded cowling, a simulated dummy motor, and the trim scheme is pre-painted and the decals are already applied. As can be seen in the video, the Nieuport builds up into a very pretty WW1 scale indoor RC plane, with a surprising amount of detail. Note the spinning rotary engine! The wing mounted Lewis gun, along with the scale rigging and other details, make this model a scale modeler's delight! This video has good detail shots as well as excellent flying views. Parkzone Ultra-Micro J-3 Cub RTF and BNF. For a change of pace from the WW1 indoor RC planes, let us consider a Cub. Maybe the most popular scale model ever! This micro sized indoor RC plane, from Parkzone is truly Micro and truly Ready-To Fly. (RTF) Just charge the batteries and fly! It is available also available as a BNF version. The BNF stands for Bind aNd Fly. This refers to the radio system used in the Cub and indicates that it is a new 2.4Ghz system. Only consider this option, if you already own a 2.4 Ghz. transmitter. If you do then this version is less expensive and it is a simple process to BIND the new receiver in the Cub to your transmitter. If you are considering buying a new radio, then I strongly urge you to consider a 2.4 Ghz. system. This is the latest technology and incorporates a stepping multi-frequency radio link. This ensures complete frequency safety. You no longer have to check if someone else is flying on your frequency spot! As you will see in the Video below, this Micro Cub is a delight to fly and is capable of the simpler maneuvers, like loops and wingovers. 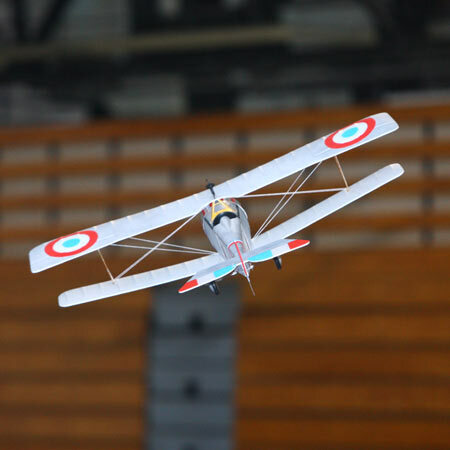 Although this is an indoor RC plane, it can be flown outdoors, but only in a dead calm! The slightest breeze will have it blowing all over the sky! Please note that this model is no longer available. For details of a wide range of indoor scale models, CLICK HERE to visit Horizon Hobby.